When it’s burgundy. And gold. And pink and yellow and, perhaps, four or five shades of green. Vegetated (“Green”) roofs have historically been used to reduce storm-water run-off, to replace vegetation that would otherwise be lost at the building footprint, to provide energy savings by buffering the roof membrane from the ambient air temperature and to extend the service life of the roof membrane by shielding it from UV exposure. 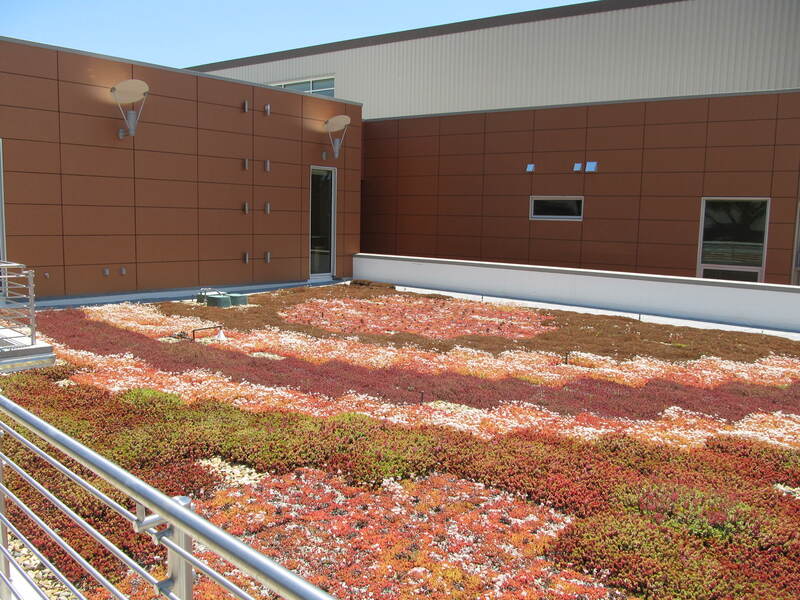 Originally seen as one of several features of the project to reduce the water-quality impacts of impervious surfaces on the project site and to improve energy performance, the vegetated roof on the Mendocino College Library Learning Resource Center is an example of how a design decision made in support of sustainability goals can also yield extraordinary aesthetic results. The roof is comprised of a single-ply roof membrane and tapered insulation with the plants contained in 12 by 24 inch LiveRoof trays provided by Florasource, Ltd. installed over a protection membrane. Heavy-weight roof pavers and ballast complete the roof components. Working with Landscape Architect Quadriga, the decision was made to use the tray module as an organizing element. Selecting from the 300 or so species of sedum available, trays containing five different sedum species have been arranged mosaic-like into a design featuring waves of color spreading across the roof surface. Pavers and ballast are used to bound the edges of the plant material and essentially providing a frame for the composition. Located immediately outside a class room and adjacent to an outdoor terrace area, the vegetated roof provides both welcome views from inside the classroom and a colorful foreground element for the views of the hills rising to the south west of the site. ← Bellevue District Office Dedication – Taylor Mountain School is Completed!